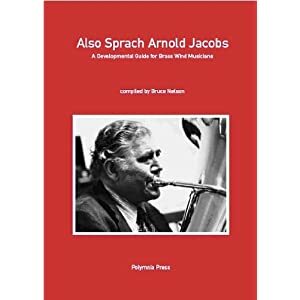 Picking up a topic from the end of Wednesday’s post, here is a review of Also Sprach Arnold Jacobs: A Developmental Guide for Brass Musicians, compiled by Bruce Nelson and published by Polymnia Press in 2006 (image linked from Amazon.com). Nelson, a former student of Jacobs and a renowned trombonist, has put together a fitting tribute to Jacobs’ legacy as a pedagogue. Though a book of this type could never replace the experience of actually studying with Jacobs or one of his students, I think it provides a great background and reference for the philosophy which guided his instruction. The book is divided into six chapters, with an introduction and two appendices. Here are the chapters. While Jacobs was a professional tuba player, it is generally recognized that his approach worked marvelously for the other brass instruments as well. Every advanced brass player and teacher should be at least familiar with some of these concepts. Nelson’s Forward provides a great context for the following chapters, and explains the development of Jacobs’ pedagogy over time. In the introduction Nelson goes on to explain just how this unique resource was compiled. I think Nelson has been very successful in coordinating and compiling all of this information into a useful, organized whole. Rather than attempting to summarize too much of the book, I thought it would be good to point out some of the underlying themes that run throughout all of the chapters. One of the most important is the idea of mentally projecting your ideal sound concept, and letting that drive your playing. As brass players, it is very easy to get wrapped up in the technical/physical side of what we do, rather than focusing on the end goal of our ideal sound. Another related idea is simplification and efficiency. Trying to directly control and order every muscle involved in playing the horn is impossible, and often results in unwanted tension. This is something I work on every single day…and some days are better than others. For those of us who weren’t able to study with this master teacher, books like Also Sprach Arnold Jacobs are a window into his approach. This will be a book I keep returning to, for both knowledge and inspiration. To close I’ll leave you with some more quotes from Arnold Jacobs. Yeah, it’s a great read! Let me know what you think of the Don Greene book.